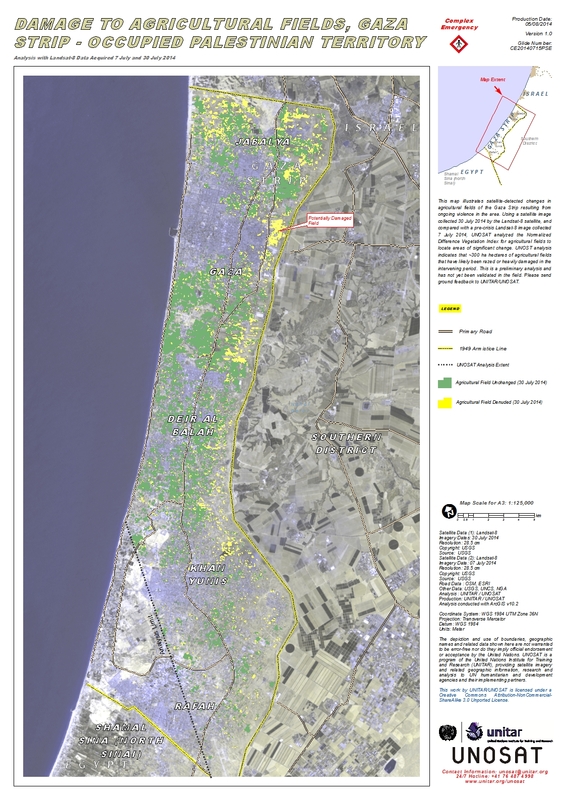 This map illustrates satellite-detected changes in agricultural fields of the Gaza Strip resulting from ongoing violence in the area. Using a satellite image collected 30 July 2014 by the Landsat-8 satellite, and compared with a pre-crisis Landsat-8 image collected 7 July 2014, UNOSAT analyzed the Normalized Difference Vegetation Index for agricultural fields to locate areas of significant change. UNOSAT analysis indicates that ~2000 ha hectares of agricultural fields that have likely been razed or heavily damaged in the intervening period. This is a preliminary analysis and has not yet been validated in the field. Please send ground feedback to UNITAR/UNOSAT.